During the last week of December in 2011, the week after Christmas, I stayed at the YMCA of the Rockies with a friend in Rocky Mountain National Park. The original plan was to hike around for a few days and get some winter landscape photos. This was my first opportunity to use my bran new Canon EOS 7D camera, a very high-powered, professional grade DSLR. Its quite a camera, and a big step up from my original 450D. I was pretty excited to go out and use it in a more “real” capacity since my purchase of it a couple weeks before (kind of my own personal Christmas gift!) As often occurs, life threw me a curve ball. The first day there things started moving a bit late. It took longer to get to the park than expected, and longer to get settled in at the YMCA than expected. We had some time to scout around the park and plan out the next few days. The second day of the trip turned out to be the only productive day, as a very large winter storm started moving in by late morning, and it was sure to engulf the park in a high altitude mountain blizzard within a day. 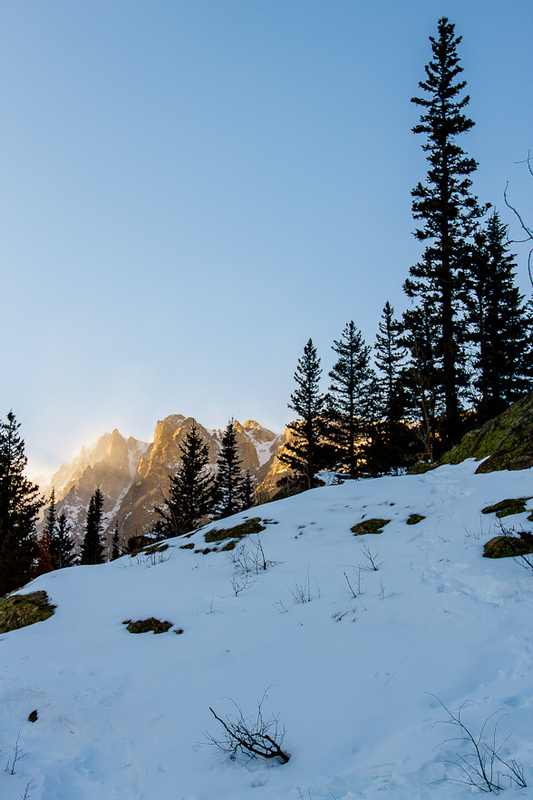 We took our chances and headed up one of the Bear Lake trails, and hiked through the snow all the way up to Emerald Lake, nestled just beneath Hallatte and Flattop peaks in the continental divide. The shot above was the only other really decent keeper out of the day. The distant peak of Flattop Mountain shot through the trees along the trail as we were headed back down off the divide. The encroaching winter storm can be seen just beginning to shroud the mountains at this point. By the time we were back down to Bear Lake, the mountain peaks were fully backed by dark clouds, and that was barely even 3pm, when we had started hiking around 11am. By evening the entire divide was buried in the brooding clouds of a monster storm, and the next day the storm was moving down into Estes Park. The trip was sadly cut short at that point, but I am glad I managed to get a couple good landscape photos out of it. I also had the chance to explore my new Canon 7D, and learn its capabilities. All I can say is, wow! I love this camera! !